When you need something zesty to brighten up your solid outfit, try BRIGHT MULTICOLOR combinations in a handbag and jewelry. This page offers some ideas to inspire you. Collage of prints under faceted glass, simple shape that is packed with interest. 1-3/4 x 1-3/4 inches, easy size to wear and light in weight, this pin has colorful beads arranged to depict the rooster. Velveteen on the back. 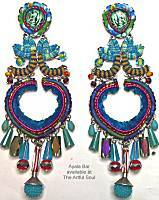 For more accessories that feature lots of bright multicolor ideas, see our Especially Colorful Style designers list. 2 inches long including sterling earwires, 9/16 inch across. Leaf-shaped convex metal shape, lightweight, glimmering white backing. The artwork has swirls of colors green, blue, red, and yellow. 2-1/4 inches long including silver coated surgical earwires, 9/16 inch across. Leaf-shaped convex metal shape, lightweight, glimmering white backing. The artwork is a bright parrot wing feather of red, lime and aqua. 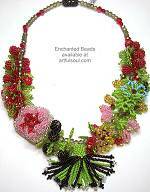 19 inches long, 1-3/4 inch wide at center, the clusters and garlands extend 11 inches across the front, with 6mm crystal beads finishing in the back. Strong magnetic clasp is completely covered in glass beads so no metal is showing. This stunning neckpiece features woven blossoms, berries, leaves and tendrils, tassel in the front, the larger champagne crystal beads form the stem upon which everything springs forth. Colors include lemon-lime, tangerine, aqua, lavender, teal and bronze. Wondrous abstract motif in bracelet with irregular edges and patterns within, formed from beads in bright cobalt, orange, yellow and green colors, secured to red fabric backing. Up to 1-3/4 inch wide, the ends have silver beaded ribbon attached to foldover metal clasp. Goes around wrist smoothly, 7-1/8 inches long, can be worn snug. About 1 inch across, colorful beads surround a silver stud at center. The colors include bright yellow, red, orange and green, secured to red fabric backing. CLIP ON style for all ears. 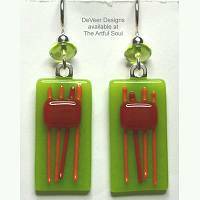 Colorful beads are secured to flexible red fabric backing, formed into elegant flat pod shape and suspended from short silverplated earwire that has a sleek contemporary shape befitting the earring style. About 2-1/4 inches long overall, 3/4 inch across, the colors are bright red, yellow, orange, green, pink and cobalt. 1-1/4 inches long including sterling earwire, 5/16 inch across. The silvertone frame holds multicolor crystals in teal, fuchsia, red and more, on a jet black enamel background. 1-3/4 inches long, 3/4 inch across, on sterling earwire. Silvertone settings of square and rounds flare out in chandelier gracefulness, featuring crystals and tiny beads in teal blue, pale green, fuchsia, orange, and aqua. 3/4 inch square pendant is suspended from blackened steel chain to 16 inches long, lobster clasp, 2 inch extender chain. 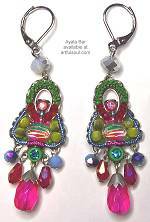 The metal frame is filled with an elaborate mosaic of tiny glass and crystal beads in colors of turquoise, periwinkle, lime, tangerine and fuchsia. Metal fleur-de-lis elements adorn each corner. Dragonfly pendant is 1 inch long, 5/8 inch across. Delicate and interesting, the dragonfly shape in silver metal is accented with glass and crystal beads in turquoise, orange, lime. Suspended with dancing crystals across front 2 inches of steel chain, adjustable length 16-17.5 inches, lobster clasp.